The lilies illustrated here are Oriental hybrids (Division VII). These are based on hybrids within Lilium section Archelirion, specifically L. auratum and L. speciosum, together with crossbreeds from several species native to Japan, including L. nobilissimum, L. rubellum, L. alexandrae, and L. japonicum. They are fragrant, and the flowers tend to be outward facing. Plants tend to be tall, and the flowers may be quite large. The whole group are sometimes referred to as "stargazers" because many of them appear to look upwards. 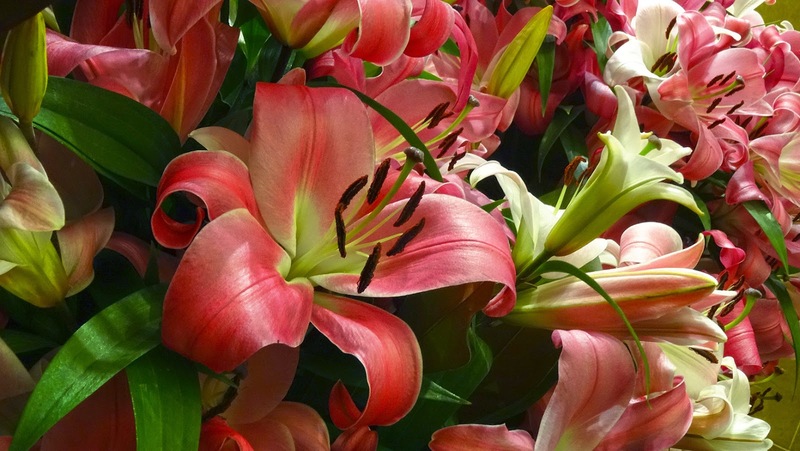 They are used extensively as a cut flower and are long-lasting in flower arrangements. Vinca major, with the common names bigleaf periwinkle, large periwinkle, greater periwinkle and blue periwinkle, is species of flowering plant in the family Apocynaceae, native to the western Mediterranean. Growing to 25 cm tall and spreading indefinitely, it is an evergreen perennial, frequently used in cultivation as ground-cover. The genus name probably derives from the Latin word vincire, meaning bind, as the long creeping vines were used to prepare garlands. The species name major refers to the larger size in respect of the similar Vinca minor L.
Vinca major is a trailing vine, spreading along the ground and rooting along the stems to form dense masses of ground-cover individually 2–5 m across and scrambling up to 50–70 cm high. The leaves are opposite, nearly orbicular at the base of the stems and lanceolate at the apex, 3–9 cm long and 2–6 cm broad, glossy dark green with a leathery texture and an entire but distinctly ciliate margin, and a hairy petiole 1–2 cm long. The flowers are hermaphrodite, axillary and solitary, violet-purple, 3–5 cm diameter, with a five-lobed corolla. The calyx surrounding the base of the flower is 10–17 millimetres long with hairy margins. The flowering period extends from early spring to autumn. 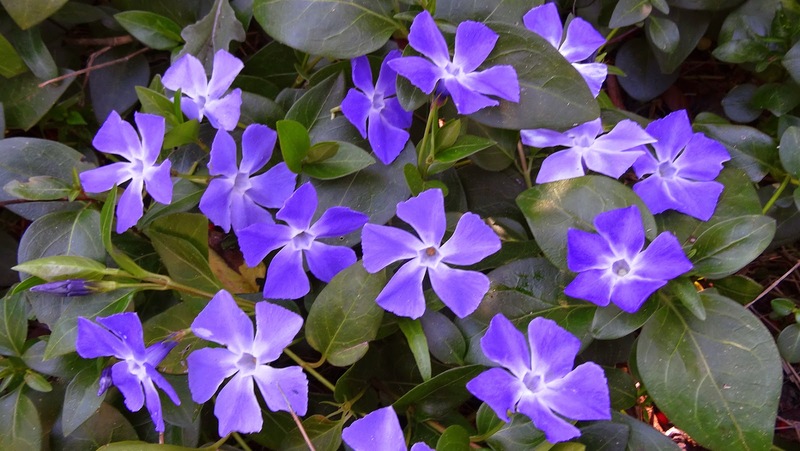 Vinca major is a commonly grown ornamental plant in temperate gardens for its evergreen foliage, spring flowers, and ground-cover or vine use. Many cultivars are available, with differences in flowers, such as white to dark violet flowers, and different patterns and colours of variegated foliage. The cultivar 'Variegata' has gained the Royal Horticultural Society's Award of Garden Merit. 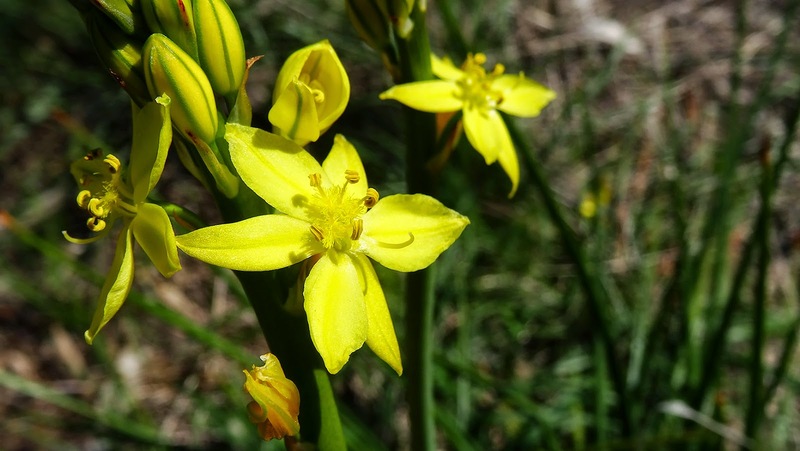 Bulbine semibarbata, commonly known as Leek Lily, Native Leek or Wild Onion, is a species of annual herb native to Australia. It grows as an annual herb from 7 to 45 centimetres high, with yellow flowers. It is widespread in Australia, occurring in every state except the Northern Territory. It prefers white or grey sand, sandy clay, or loam, and favours areas that are wet in winter, such as granite outcrops, creek lines, the margins of salt lakes and along the coast. Bellis perennis is a common European species of daisy, of the Asteraceae family, often considered the archetypal species of that name. Many related plants also share the name "daisy", so to distinguish this species from other daisies it is sometimes qualified as common daisy, lawn daisy or English daisy. Historically, it has also been commonly known as bruisewort and occasionally woundwort (although the common name woundwort is now more closely associated with Stachys). 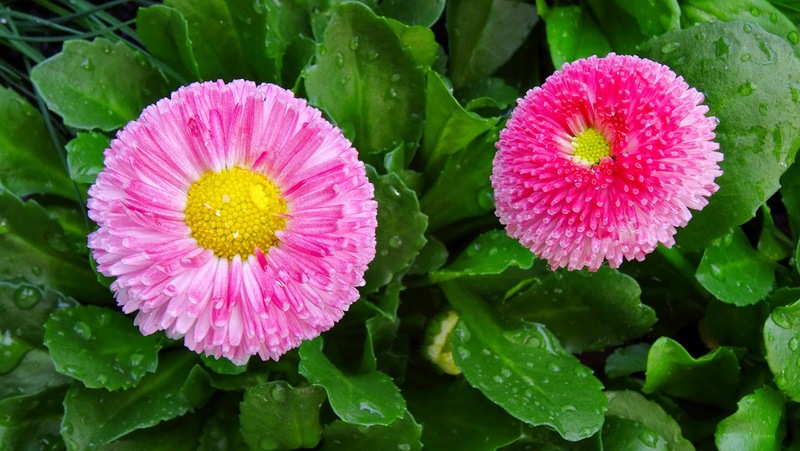 Bellis perennis is native to western, central and northern Europe, but widely naturalised in most temperate regions including the Americas and Australasia. B. perennis generally blooms from early to midsummer, although when grown under ideal conditions, they have a very long flowering season and will even produce a few flowers in the middle of mild winters. Numerous single- and double-flowered varieties are in cultivation, producing flat or spherical blooms in a range of sizes (1 cm to 6 cm) and colours (red, pink & white). They are generally grown from seed as biennial bedding plants. They can also be purchased as plugs in Spring. The cultivar 'Tasso series' has gained the Royal Horticultural Society's Award of Garden Merit. This daisy may be used as a potherb. Young leaves can be eaten raw in salads or cooked, noting that the leaves become increasingly astringent with age. Flower buds and petals can be eaten raw in sandwiches, soups and salads. It is also used as a tea and as a vitamin supplement.